George Graham Reviews Mark Knopfler's "Sailing to Philadelphia"
Twenty five years ago, one of the more interesting bands to come out of England was Dire Straits. Their front-man, lead vocalist and distinctive guitar player was Mark Knopfler, who founded the band with his brother David. Starting with their offbeat first hit, Sultans of Swing the group grew to be one of the most successful bands of the period, selling some 80 million albums, and packing stadiums on world tours. While Dire Straits gradually wound down with the personnel becoming rather variable, Mark Knopfler increasingly became its focus, and at the same time launched a solo career creating music for films. He also became rather musically peripatetic, doing projects with everyone from the traditional Irish band the Chieftains to country guitar legend Chet Atkins. After a series of these side projects, four years ago Knopfler released Golden Heart, his full first solo album, which was a outstanding effort that combined the spaciousness of the latter-day Dire Straits with Knopfler's wide-ranging musical interests, reflected by the album having been recorded in Dublin, Nashville and Los Angeles. 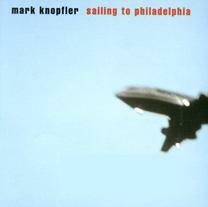 Now, after more film music projects including Wag the Dog and Metroland, Knopfler is out with only his second solo album, Sailing to Philadelphia. And like its predecessor it turns out to be a gem. Although the recording venues are not stated in the new CD's credits, it is also fairly wide-ranging stylistically, with an interesting collection of guests, including James Taylor and Van Morrison appearing. But unlike Golden Heart, this CD has a regular band that runs through the whole album and gives it a more unified sound, though it is no less large in its musical vision than its predecessor. Knopfler calls his band the 96ers, since that was when they got together and have been collaborating since. They include musicians who were prominent on Golden Heart, including two keyboard men, Guy Fletcher, who was in the last incarnation of Dire Straits, and studio ace Jim Cox, guitarist Richard Bennett, who provides a nice foil to Knopfler's guitar style, plus bassist Glen Worf, a Nashville regular, and drummer Chad Cromwell. The two keyboard line-up provides a certain richness of sound, and contributes to the sometimes atmospheric quality of the album. Knopfler's guitar work remains distinctive and very tasteful. While he does some worthy solos on both electric and acoutsic guitars and Dobros, he seems to want to blend into the ensemble arrangements more this time. Vocally, Knopfler is in great form, using his one-of-a-kind gruff voice to great effect, with surprising sensitivity on some songs. Lyrically, the album is a set of separate, unrelated songs. But Knopfler later realized several of them touched on the idea of perseverance and aspiration. The CD contains some of the most interesting lyrics Knopfler has written, including a consideration of the lives of the famous 18th Century surveyors Mason and Dixon, the subject of racial discrimination as suffered by a Gospel group, and the first meeting of a mail-order bride and her husband-to-be. On the other hand, the album also contains some songs of more pedestrian subjects, including yet another song by Knopfler about pop stardom. The guest vocalists add a nice touch. Sometimes their contributions can be subtle, as in the case of Gillian Welch and David Rawlings, or Squeeze's Chris Difford and Glenn Tilbrook, while both James Taylor and Van Morrison are given some lead vocals of their own. As productive as Mark Knopfler has been with Dire Straits, his various collaborations and guest appearances on other people's records, along with his continuing stream of film soundtracks, Sailing to Philadelphia is only his second solo album project, coming four years after its predecessor. But it was worth the wait. It's another great example of the skillful nexus of compositions, lyric writing, arrangements, nonpareil musicianship, and general sonic excellence that have been a Knopfler trademark for over two decades. While not as geographically and stylistically diverse as Knopfler's last album, the new production's use of guest vocalists adds an interesting new facet, and working with a regular band adds a degree of musical unity to the album of song that are otherwise fairly unrelated lyrically. It comes together impressively in an album that is both a pleasure to listen to, and also fascinating and deep. As is typical for a Mark Knopfler album, the mix is superb. The blend of synthesizers and Knopfler's distinctive guitar work is a textbook example of first-class sonic production. Compliments to recording and mix engineer Chuck Ainlay. Because this CD was released on a major US label, where industry practice is to compress the sound in a loudness war with the competition, the music's dynamic range is degraded on some tracks, so when some of the songs build to louder passages, the music does not gain much. But other of the tracks have greater difference between soft and loud. Overall, it makes a worthy showpiece for a good stereo system. Mark Knopfler is another of those relatively rare performers from the rock era who continues to get better with time long after his pop hit heyday.